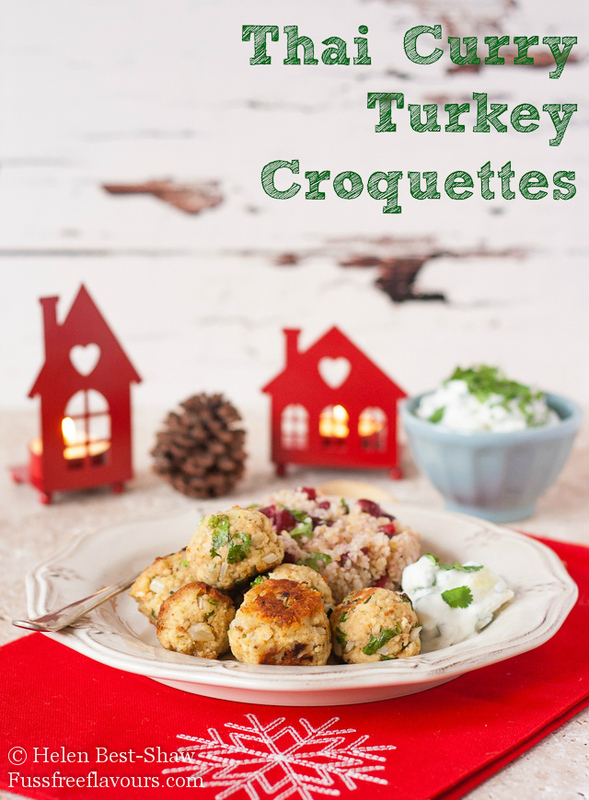 These turkey croquettes or koftas flavoured with the zingy bold flavours of coriander, ginger and lime are perfect for using up left over Christmas or Thanksgiving turkey or chicken. Accompanied by jewelled cranberry cous cous – which handily uses up some left over cranberry sauce – this lighter meal will refresh your tastebuds after the heavier traditional Christmas or Thanksgiving foods. I like to use a mixture of grains, so here I have used equal quantities of cous cous and bulgar wheat. For more Thai Curry inspiration you may like my vegan & gluten free Thai Curry Spicy Bean Burgers, leftover cous cous is delicious fried up with an egg and some extra vegetables as egg fried cous cous. If you try this Thai Curry Turkey Croquettes with Cranberry Mixed Grains please tag #FussFreeFlavours on Instagram or Twitter. It is amazing for me when for me when you make one of my recipes and I really do love to see them. You can also share it on my Facebook page. Please pin this recipe to Pinterest too! Thanks for reading Fuss Free Flavours! 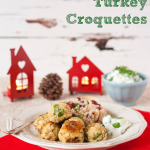 Leftover Christmas or Thanksgiving turkey is used in these zingy fresh green Thai curry flavoured croquettes, served with jewelled cranberry mixed grains. Break the bread into smaller pieces and pulse in a food processor or blender along with the turkey until the mixture resembles fine crumbs. Transfer the turkey and bread mixture to a bowl and add the other ingredients mixing well with your hands. Using your fingers shape and roll the mixture into 24 walnut sized balls. Cover and leave in the fridge for an hour to firm up. Fry over a medium heat, turning frequently for about 5 minutes until golden brown. Serve the croquettes with the cous cous and some tzatziki.